I made a Valentine’s Day set of division cards to use with LD over the next week or so. We use these cards to play a game called Fast Track — an idea we got from Peggy Kaye’s Games for Math. 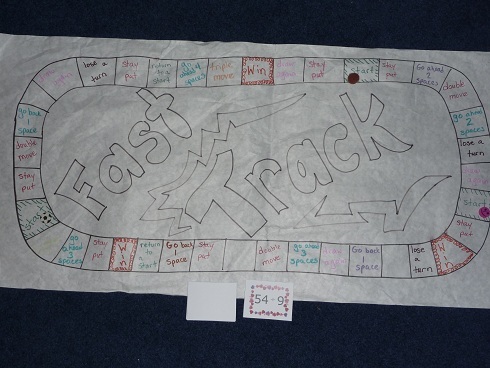 To make the board you need a large piece of butcher paper or poster board. There are three win spaces, three start spaces and various directions on the other spaces such as stay put, move ahead three, double move, triple move, go back 1 space, lose a turn and so forth. 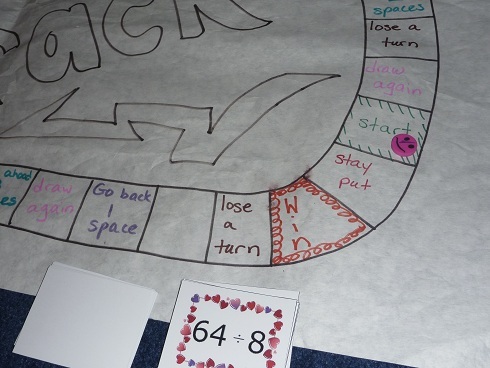 Each player takes a turn turning over a card and solving the problem. He/she moves ahead that many spaces and follows the directions on the space. For example, if he moves ahead 10 and lands on a double move space, then he gets to take another card and go again. The first player to land on a “win” space wins the game. 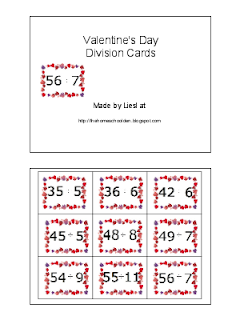 You can download a set of the Valentine’s Day Division Cards here if you are interested. Here’s another glimpse at the game board I made over a year ago. 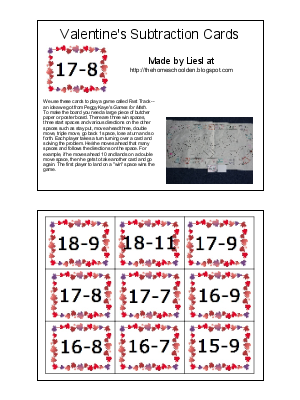 Valentine’s Day Subtraction Cards here. 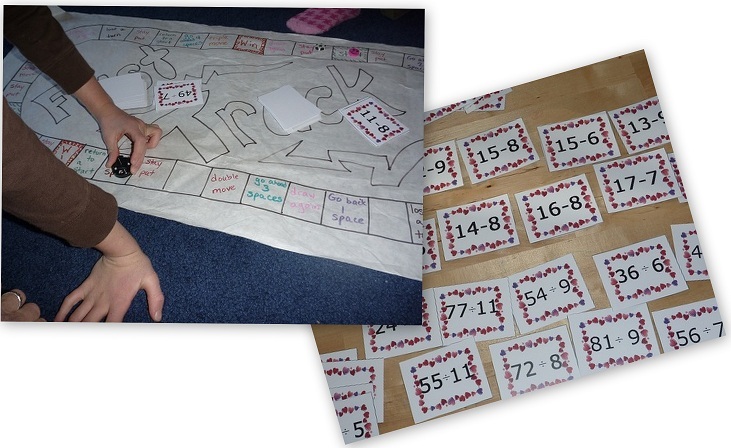 We all played the game together with LD using his division cards and DD using her subtraction cards. 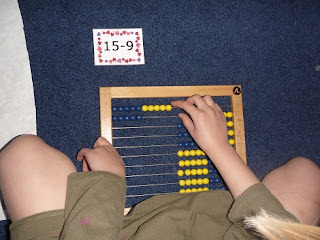 Since DD is still working on these subtraction problems and doesn’t know them by heart, she uses her abacus (pictured below) to help her work through the problem. We still use many of the wonderful ideas and manipulatives from the Right Start Math curriculum, though we use it as an extra rather than our core math. Last year when we played this game, DD was working on sums of 10 through 17. I made a set of cards for her and you can download the Addition Cards here. The other game we’ve been playing is just a simple eraser toss game. ED has trouble remembering her numbers consistently by sight so she simply has to tell us the number she landed on. DD has to double the number she lands on while LD has to square the number. It’s a quick game that all three kids enjoyed. In the photo below is a skip-counting maze I printed out for DD. 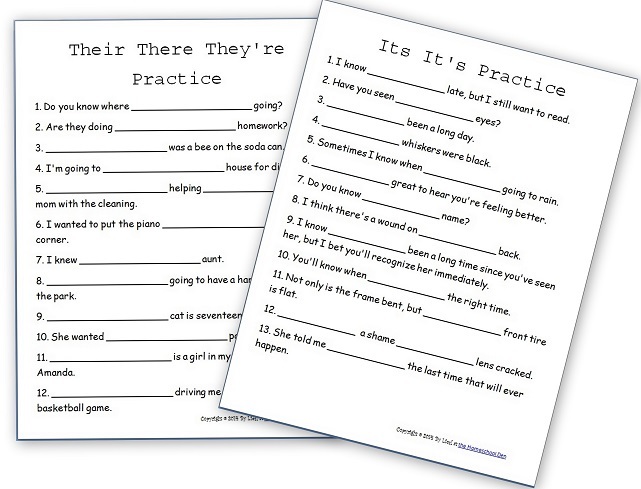 You can find it and other skip counting sheets (1s,2s,3s,4s,5s) at Print Activities. 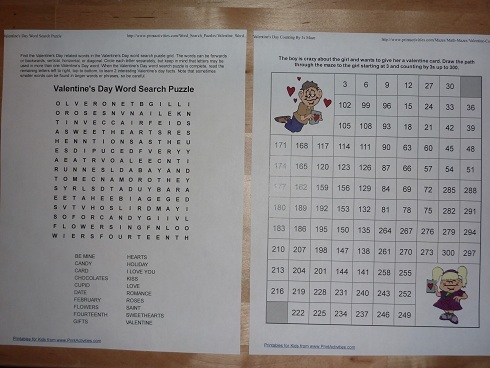 Finally, here are the Valentine’s Day activities we did last year. Our Move: On another note, next week, the week of Valentine’s Day, our blog will be joining the Parent‘s team over at Parents.com/blog. I’ll have a link from this address to get you there. I hope you’ll check in on us there! We’ve done some great experiments and will be sharing more about our geography, history and preschool activities in the next couple of weeks. What a fun math heart! We love throwing games, so this would be perfect for us. Next story The Face Behind the Blog!